Iron Maiden founder, bassist and primary songwriter Steve Harris was 12 years old when Where Eagles Dare arrived in theaters on March 12, 1969. In 1983, Harris paid tribute to the World War II-set movie, which starred Clint Eastwood and Richard Burton, with a song by that name that opened Iron Maiden's fourth album, Piece of Mind. He's often written songs inspired by movies; even his band's name was influenced by the 1939 sword-fighting epic The Man in the Iron Mask. Harris referenced a particularly memorable scene from Where Eagles Dare with the line, "Bavarian alps that lay all around they seem to stare from below / The enemy lines a long time passed are lying deep in the snow." He wrote all of the music too. He's said when he's listed as the sole composer of a song, "that means I write absolutely everything. Rhythm guitar parts, guitar melodies, vocal melodies, absolutely everything really. The only thing I don’t write is the guitar solos but even then I might suggest one or two things." But as he told Bass Player in 2015, "I can’t play bloody drums to save my life." So he tapped out a pattern on his legs for Nicko McBrain, who had only recently joined the band, that he wanted for the song's introduction. When Harris heard it all come together, he reportedly said, "That's it!" -- and the result was a charging percussion ensemble to kick off the song. Eastwood was one of Hollywood's biggest stars when he joined the cast of Where Eagles Dare as the suspicious American Ranger Lt. Morris Schaffer, who joins up with members of British Intelligence to rescue an important American general apprehended by the Germans. At this point in his career, Eastwood had made a series of movies playing tough guys, including three acclaimed films with director Sergio Leone in which he was a trigger-happy gunslinger known only as the Man With No Name. Film buffs have approximated the total kill count for Where Eagles Dare to be somewhere between 87 and 100, with Movie Body Counts claiming that Eastwood's character was responsible for 73 by himself, more than his kills in all three Leone films combined -- there's 41 among A Fistful of Dollars, For a Few Dollars More and The Good, the Bad and the Ugly. Eastwood reportedly refused to cut his hair for his role in Where Eagles Dare. He also wanted to do his own stunts, many of which were abjectly perilous, but he was shut down by the studio because he was "too valuable." And even though Eastwood is pretty much the star of the movie, top billing went to Burton. To make up for this, Eastwood had it written into his contract that the studio had to furnish him with a Norton P11 motorcycle. 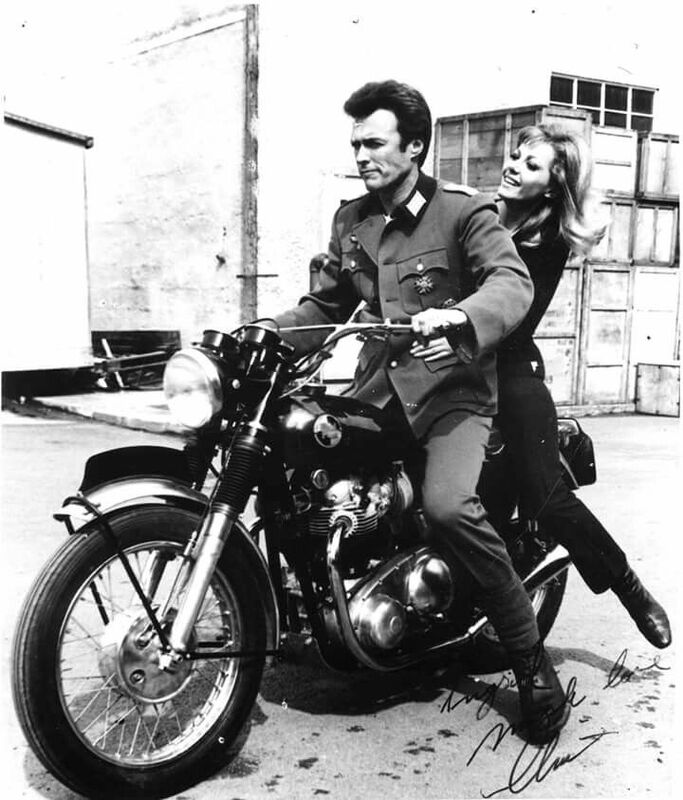 Later, and much to the MGM's shock, Eastwood took the bike for a ride at a racetrack with actress Ingrid Pitt, who was also in the movie and was a regular in Hammer Films' horror movies. During one of Where Eagles Dare's climactic final moments, Burton's character calls Eastwood's out for being a "second-rate punk," using a word that seems a bit out of step with the movie's World War II setting. Fast-forward three years later, and Eastwood became synonymous with the word with his portrayal of San Francisco cop Harry Callahan in Dirty Harry, where he menacingly asks a bank robber, "You've got to ask yourself one question: 'Do I feel lucky?' Well, do you, punk?"